While in middle school our family lived in West Germany. We took advantage of our proximity to other countries by vacationing to as many as we could during our nearly 5 year residence overseas. With the exception of West Berlin, the Eastern Bloc was off limits to Americans, so we focused on the “free” countries around us. France, Spain, Holland, England and more were the destinations for summer vacations or school field trips. One country we were able to experience was Italy. I use the world ‘experience’ because to me it was more than just a visit. Most countries are similar to our own, just with slightly different construction, food and cultures. Ultimately they’re all part of what the world refers to as the “West”. But I saw something different in Italy. Sure, the politics aligned with those of the U.S. and the people and food were familiar. It was our weekend in Venice that really influenced me. Experiencing the canals and waterways, and how the residents utilized them as naturally as we do roads and pathways, forever changed my views on how people were expected to live. What it really did was remove all expectations entirely and made me realize that the human race can adapt to almost any environment or hardship. 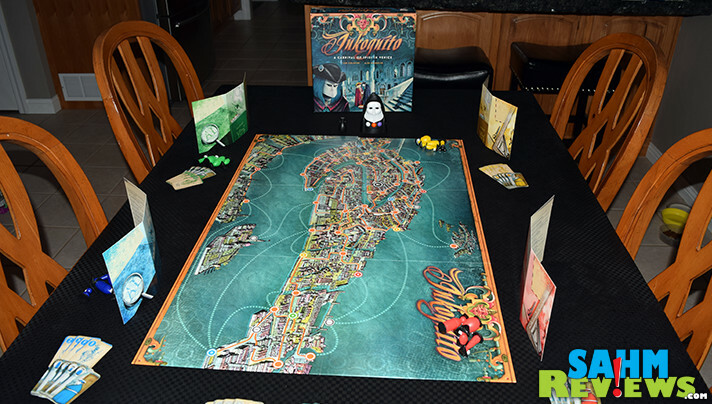 Those memories came flooding back when we recently played a few rounds of Inkognito by Ares Games. 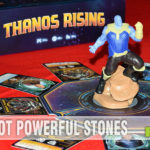 Originally published by Milton Bradley back in the late 1980’s (and a few other publishers since), Ares brought it back to life in 2013 with an updated version for the English market. For us it was brand new as we had never had the opportunity to play it previously. We’ve classified this game as semi-cooperative, but in reality it is team-based. Advertised for 3-5 players, the sweet spot is really four players who play as two teams of two. That’s where Inkognito becomes difficult to describe. The team members do not know who the other teammate is at the beginning of the game and is part of the challenge in order to win (to discover who you’re teamed up with)! 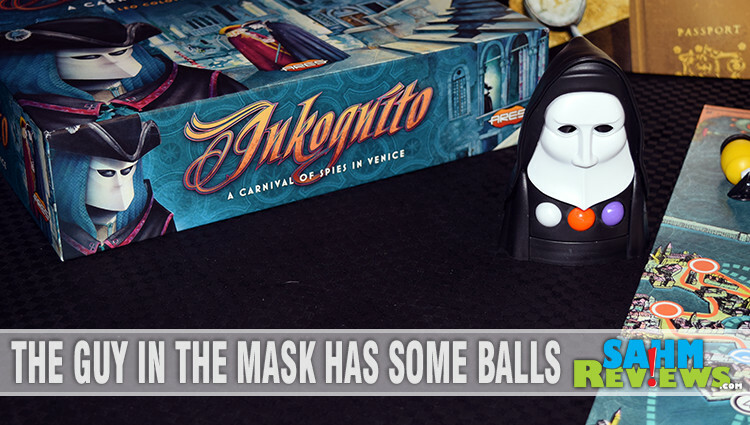 You and the other players take on the role of one of the four masters of deception attending the annual carnival in Venice. Everyone has their own secret mission, but also do not know (yet) exactly what it is! 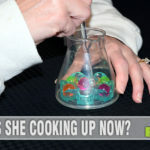 You know which of the four characters you play, either Lord Fiddlebottom, Colonel Bubble, Agent X or Madame Zsa Zsa, but are not aware of the roles of the others at the table. It is up to everyone to decipher the identities of the other players, discover your team’s mission and accomplish the task before the other teams completes theirs! 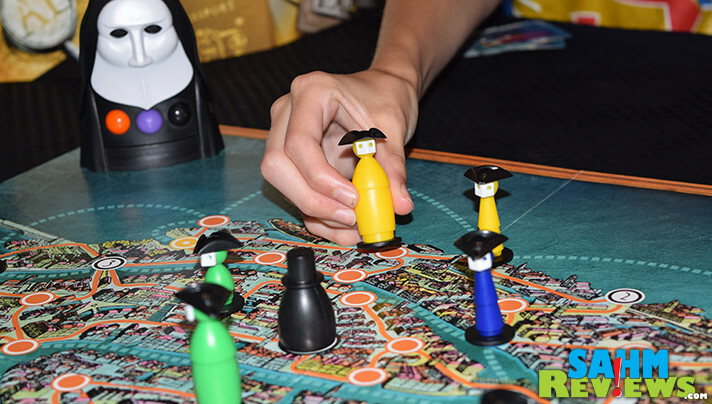 Each spy takes the four colored pawns of their choosing and begins the game in the matching colored spaces on the board. Not only do you not know your teammate, you actually do not know which of your four pawns represents your actual spy! Each one is shaped differently (short, tall, fat, skinny) and will be revealed to you when you receive a build card during setup. 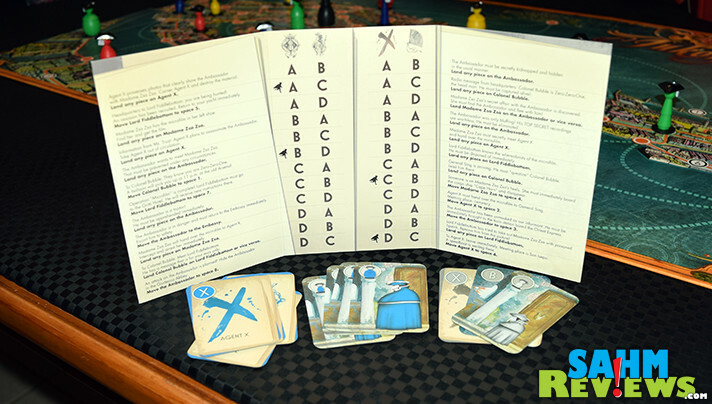 Additionally, at this point you’ll also receive an identity card which tells you which named spy you play as and a mission card that when combined with your unknown partner, indicates how to win the game. An Ambassador token is also placed in its designated spot, is a friendly character who sees and hears all and may be of value to you as you try to discover the other spies. Orange lines on the Inkognito board represent land movements, while blue dashed lines denote movement over water. 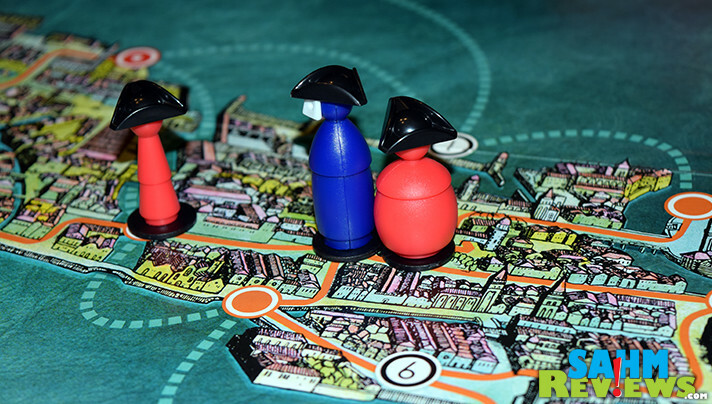 In many games you choose your actions from a list or by placing a meeple on an action board. In Inkognito, your actions available to you are chosen at random by the included Phantom of Prophecy Randomizer. This unique shaker includes colored wooden balls that will populate into three undersized holes in the front of the unit. The color results determine which actions you will take on your turn. An orange result allows you to move one of your own figures one space along a land route. Blue does the same, only over water. White awards you with the choice of one space over land or water, while purple (dark blue) lets you move an opponent’s figure one space over either. Lastly, if you shake out a black ball, you may move the Ambassador one space, also on land or water. Ultimately you’re attempting to land your pieces on the same spots as other players or requiring them to move to your space. At that point you may ask them a question, which they will answer semi-honestly. If you ask them about their identity, they will show you two of their identity cards and one of their build cards. At least one of them must be true. If you inquire about their build type, they will show you two of their build cards and one identity card, again with at least one being true. If you ask the Ambassador about either the build or identity of another player, that player must show you two of the requested card type and one of the other, with only one needing to be true. Along the way you’ll want to keep good records of both the responses from each player and the responses you give to other participants. You may not give the same answer to the same player and there are penalties for doing so! 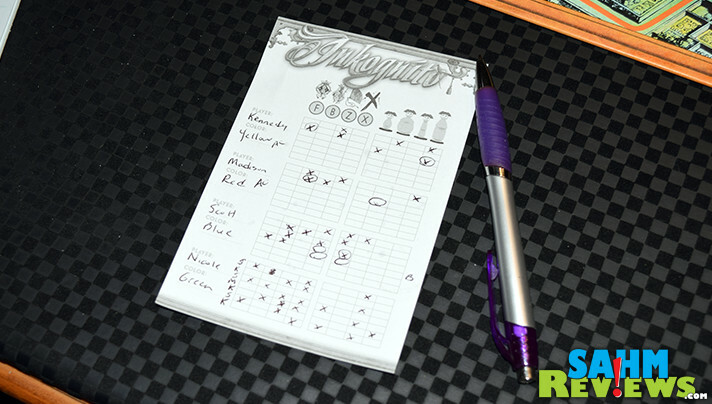 After you have questioned the figure of another player, you must send that figure to any unnumbered and unoccupied space on the board. 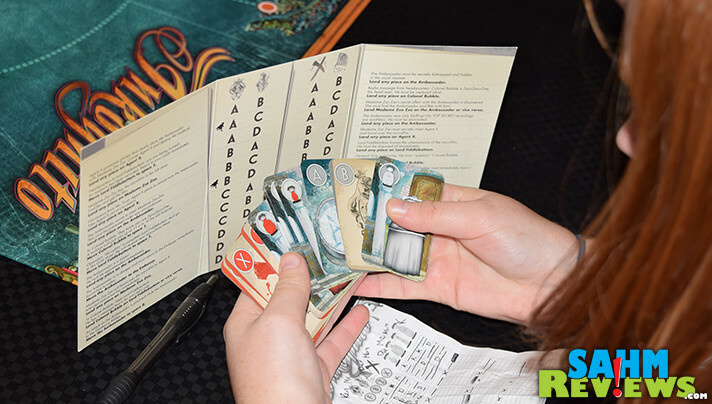 While at the beginning of a game of Inkognito you’ll want to keep your identity secret, at some point you must reveal yourself to the player you believe to be your partner so you may work on your final mission together. This can be done with secret messages (winking an eye, etc.) or by showing them cards that will give away your role. Hopefully you have revealed yourself to the correct person and can decode your mission on the included player passport boards. Now you know what you have to do to win! These will range from getting a specific pawn to a specific location to escorting the Ambassador back to the Embassy. Twenty-four possible combinations of role and build type leads to 24 different missions. Rarely will every game be the same! The first team to complete their mission wins Inkognito! An interesting mix of movement similar to Last Friday and puzzle-solving as in Alchemists, it is hard to believe this was a game from the 80’s since it incorporated so many things you see in modern board games. Currently only available through Amazon 3rd party sellers at an inflated price, you might have better luck at your local game store or on eBay. Curious about the other titles in Ares Games lineup? Head over to their website or follow them on Twitter and Facebook to see what they’re issuing next! 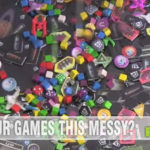 Do you enjoy hidden-role games? You had me at team based. I am all about encouraging my kids to work together. Bonus points if they learn a thing or two in the process. 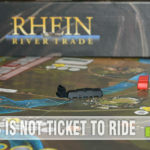 How fun to try a new boardgame together. 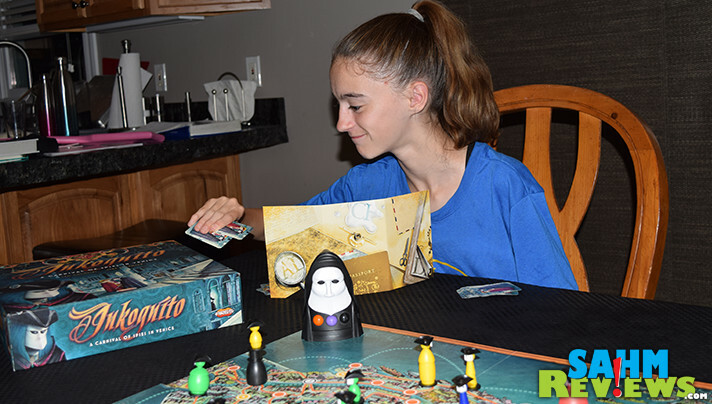 Our family really likes boardgames & we’ve had a lot of fun with team based games, too! Love that this game brought you back to living and traveling overseas. What a fun connection to be able to share with your family. This sounds really interesting! I love that you don’t know your teammate, that’s very cool. That phantom is kinda creepy though! This looks like a great addition to your games. Inkognito reminds me a bit of Risk which I never mastered. Ha! But I love strategy games and I’m betting with a bit of practice and experience I could master it. 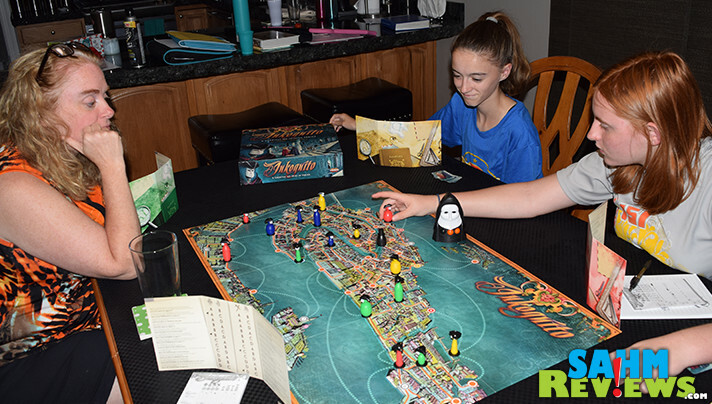 I’m a big fan of games that make us think and bring about family fun!